The Great Courses - We were introduced to this excellent resource through a homeschool co-op class. I had not even considered them for Amber's use, even though I knew they existed. We now have quite the library of Great Courses DVDs. (Greek and Roman Technology is still her favorite). Netflix & Amazon Prime Video - These two work best over a wi-fi connection and we have to remember our login information (which doesn't always happen). However they have some amazing options if you can find them. Personally, I've had limited success searching by topic and have relied on blind luck (or recommendations from others) in finding topical resources. HelpTeaching.com - This little gem of a site uses some of their own videos as well as sourcing videos from other sites such as Crash Course and Khan Academy. I love how they have related worksheets and tests linked right with their video lessons. It also keeps me from searching through Khan Academy for just the right video. 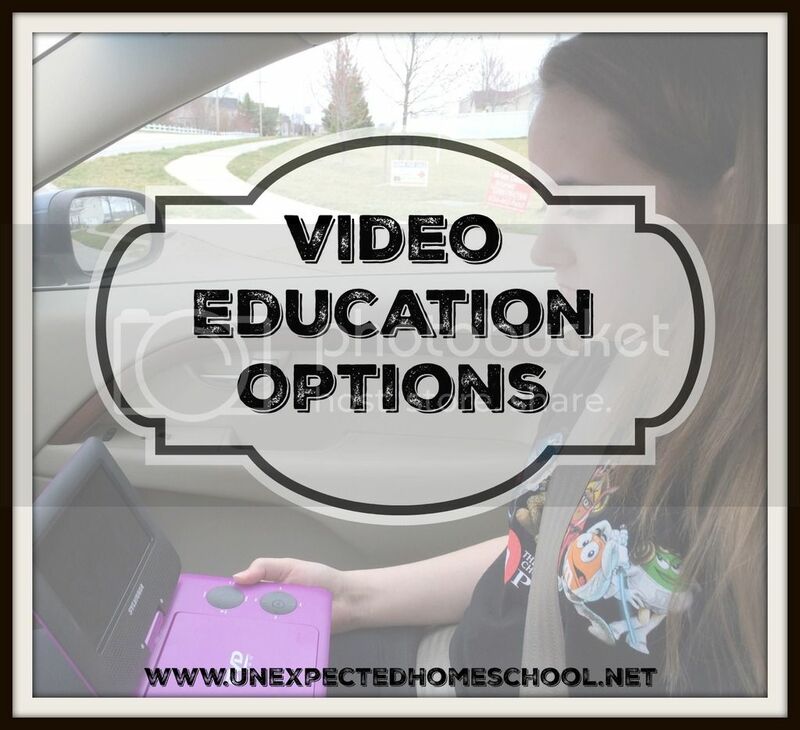 Of course there are dozens of other video education options, including Khan Academy. However, some of them provide such a wide array of lessons that I find it easier to use the above options. I also do not allow Amber to search the internet on her own. So while she could find a bevy of education material online, I prefer to give her direct video link assignments. How do we make them more than just a video? Using one of our video lesson sources, Amber will watch the assigned portion independently. Occasionally, she will leave the sound up, depending on the situation, so that I can hear as well. However, most times she watches either on her portable DVD player or on her iPad with a headset because it makes the experience more personal and easier for her to hear. If the video has any accompanying text, like the Great Courses DVDs, then Amber usually goes through those after watching. On a very rare occasion will she follow along during the DVD. Otherwise, if we are using the video in place of a history reading source, Amber continues on with the history assignments as scheduled. If it is a supplement to another subject, then I encourage Amber to discuss with me what she learned or retained from the video. I'm somewhat difficult about the video lessons though. If Amber can't prove through discussion or her assigned work that the lesson was just as effective as her book work, then we move on to another video choice or back to the books. Addison has used the Great Courses as well! I also got a Great Courses National Parks geology series for Christmas and now Brennan is using it as an elective. That's a great "V" topic! I should incorporate more videos to break up the routine sometimes.